Hatton National Bank (HNB) and the Federation of Chambers of Commerce of Sri Lanka (FCCISL) entered into a Memorandum of Understanding to promote a range of financial services to Sri Lankan SMEs. HNB Chief Operating Officer Jonathan Alles handing over the MOU to FCCISL President Kumar Mallimaratchi. HNB Chief Operating Officer Jonathan Alles and FCCISL President Kumar Mallimaratchi, signed the MOU at a ceremony held last week at HNB Towers. The signing of the MOU will be a very important milestone, as both institutions have a strong presence islandwide and have allocated substantial resources for the development of this sector. HNB with it's network of 220 Customer Centres, strong brand name, a comprehensive product portfolio and a strong focus on customer care, is well strengthened and capitalized to launch this initiative. With a view to facilitate the extending of finance to the SME sector, which has emerged as the most viable financial segment in the market, HNB launched the "HNB Small and Medium Enterprise Development Partner (SMEDP)" scheme during the early part of the current year to meet it's customer requirements. Adding strength to this mechanism, all Regional Offices have been assigned with SME Units to handle and evaluate SME applications in an expeditious manner. FCCISL is the apex organization for the Chambers and Associations in the country. Incorporating 59 Chambers and 29 Regional Chambers, they have more than a 30 year history of active involvement in SME development. 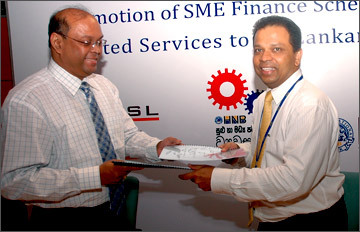 SMED the SME development arm of FCCISL also organized the "SME" Machinery and Technology Exhibition, 2011 during June 10 - 12 at BMICH, very successfully encouraging innovation and its membership displaying their commitment for the relevant sector. Signing of the MOU between HNB and FCCISL is a significant development for SMEs in Sri Lanka as it opens doors for many SMEs who require comprehensive financial solutions, thus partnering the rise of an entrepreneurial nation.